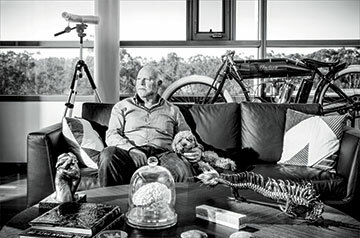 Here is an excerpt from an interview of J. Craig Venter conducted by Alison Beard for Harvard Business Review and the HBR Blog Network. To read the complete article, check out the wealth of free resources, obtain subscription information, and receive HBR email alerts, please click here. You’re known for setting audacious goals and then achieving them more quickly than most would. Why is that approach so effective for you? The goals are only considered to be audacious by other people. I consider them to be achievable. With the Human Genome Project, it was only because it had been initially set up as a 15-year, $5 billion program that it seemed inconceivable that a small group could do it in less time for a tiny fraction of the cost. To me, it seemed totally reasonable: I had an extraordinary team of people to make it so. One of my early teachers described my method as jumping off a high diving board into an empty pool, expecting my team to have the pool filled before I hit the bottom. I think the best people like to work on multidisciplinary teams where they can bring their expertise to problems and projects much bigger than themselves. How do you stay on the forefront of innovation in scientific fields that are so fast-moving? If you’re looking at it from the outside, and only occasionally seeing the headlines, it probably seems like rapid change. But, when you’re in the middle of it, progress seems slow. It was 14 years ago that my team sequenced the first genome. If you told me or anybody else that, within 15 years, we’d be scaling up to do 100,000 genomes a year, even I might have thought that was science fiction. But 15 years is a long time, the technology has changed dramatically, and actually, I’d hoped the science would have progressed a whole lot further. It’s just beginning to have serious clinical impact. With synthetic life, four years ago we announced the first cell driven completely by a chemically made chromosome, but not a lot has happened in the field since. So it seems like it’s crawling forward to me. Genomics was supposed to revolutionize the drug and health care industries, and you said it’s just beginning to do that. What industries do you expect to revolutionize with synthetic biology? At Synthetic Genomics, we’re chemically writing the DNA for entire chromosomes to design cells, and it’s hard to envision a field that won’t be impacted in some way. We just announced a deal to produce large amounts of omega-3s from algae cells to create a healthy supplement. We’re trying to design cells that produce the chemical that is the basis of plastic bottles; it currently comes only from oil. We’re designing new vaccines: The U.S. government now has stockpiles of the first synthetic vaccine against H7N9 that we made with Novartis, so we’re ahead of a potential pandemic strain. Synthetic biology is going to affect medicine, chemicals, food. People associate you with “commercializing” science. You know, before World War II, it was primarily private industry and philanthropy that funded science. Afterward, we went into this golden age of massive funding from the U.S. government, but now, percentage-wise, we’re in a dismal period of funding, and policies are limiting creativity. So business is the way to drive science forward, and people are finding there’s no difference in the goals or outcomes, because for science to impact society, it has to be economically viable: The medicines have to work and be widely available. Private investment is a way for breakthroughs to keep happening when the government is letting us down. To learn more about Venter, please click here.